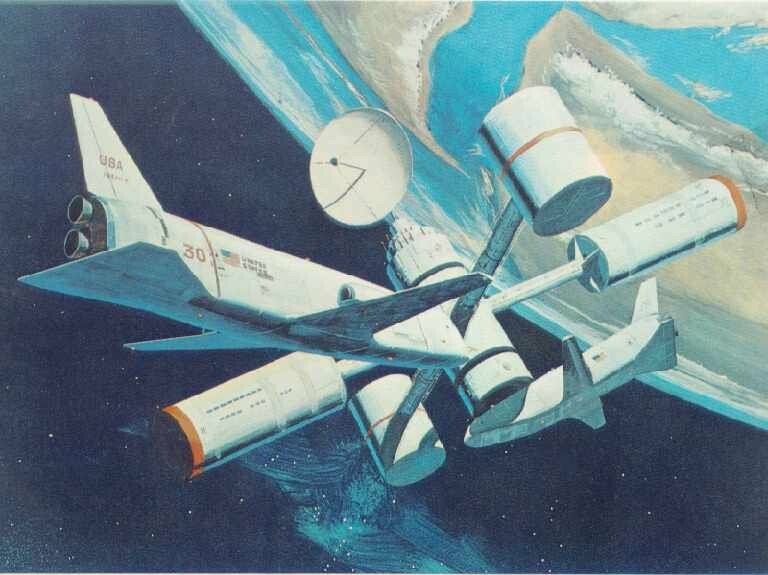 North American Rockwell's Phase-A Shuttle contract with NASA's Manned Space Center initially encompassed a number of partially reusable designs. The NAR shuttle shown on top of this page would have been launched on top of giant low-cost pressure-fed liquid or solid-propellant expendable rocket. 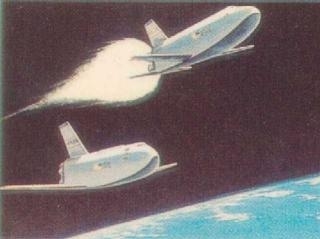 North American's early fully reusable Phase-A two-stage shuttle had the same shape. The outer wing panels would fold down ard from the vertical fin position to provide sufficient lift for landing. 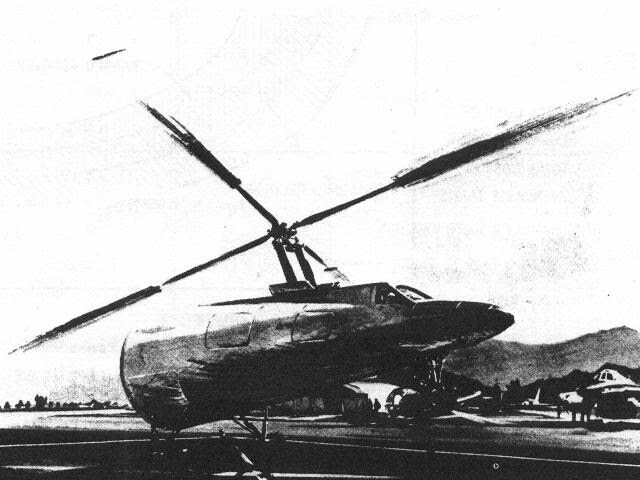 But the company also investigated numerous other options, including smaller piloted spacecraft that would have landed using rotors (shown here) or fold-out wings. 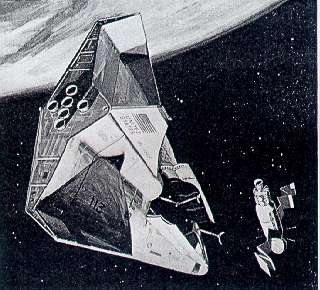 Lifting-body designs or modified Apollo capsules were also proposed as near-term interim solutions. DC-3 docks with large space base. In June 1969, NASA redirected North American to investigate a bold new concept proposed by the Manned Spacecraft Center's Maxime Faget. 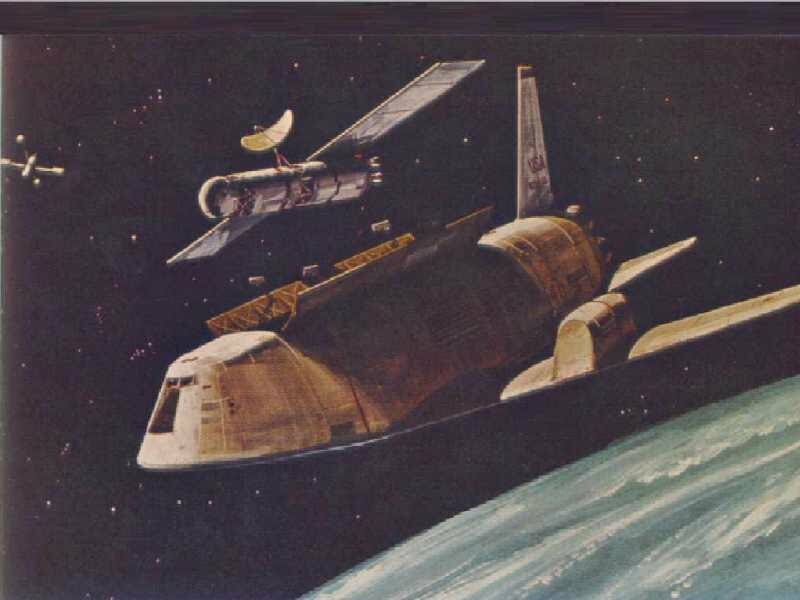 The company received a $0.25-million contract extension for this purpose, and another $2.9 million in July 1969 to develop large modular space stations and space base concepts like the early concept depicted here. Faget, the designer of the Mercury capsule, disliked Max Hunter's Starclipper lifting-body design since it had poor low-speed aerodynamics and also would be difficult to develop since the structure was tightly coupled with the aerodynamics. Faget preferred a simple winged design but he also admitted that traditional wings would be very heavy and the leading edges would be difficult to protect from the searing heat of reentry. His solution was the “DC-3” which alleviated the problem by reentering at a very high angle of attack (60 deg. ), i.e. coming in nose-high much like the suborbital X-15 rocketplane. This would only expose the flat underside of the vehicle, as most of the thermal energy goes into the shock wave forming in front of the vehicle. The high drag also shortens the duration of the heat pulse, yet does not exceed acceptable crew deceleration load factors beyond 2 g's. The DC-3 wing would only be optimized for subsonic flight and landing, greatly reducing the development cost and time. But the low lift-to-drag ratio reentry profile advocated by Faget would also create some problems since the DC-3 would have limited crossrange during reentry, i.e. it would have been unable to fly larger distances than about 430km to the left and right of an initial direction of flight. Crossrange was an important military requirement, so the USAF opposed the DC-3. DC-3 booster / orbiter stage separation at 70km altitude. The DC-3 version depicted here is the original Manned Spacecraft Center concept. The staging velocity of most Phase A designs was quite high (3290m/s) in order to achieve the lowest possible booster & orbiter mass. But this also increased the complexity of the booster which had to carry an advanced thermal protection system plus jet engines to return to base. North American estimated the system would weigh 2030t at liftoff. A fleet of six vehicles could have supported a launch rate of 50 flights per year. DC-3 satellite deployment. Max Faget originally advocated a small shuttle capable of launching only 5,580-kilogram payloads to hold down the total development cost to $5.912 billion (=$26.8B in 1999 $s) in 1970-75. North American also looked at larger configurations in the 22,680-kg payload class. Note the landing jet engine compartment on top of the wing. Only a small amount of propellant would be carried for a single go-around in the event of an aborted landing, but the range could be extended to more than 900km for atmospheric test flights or self-ferry if the payload were replaced with a jet fuel tank. Liftoff Thrust:2,543,990 kgf. Total Mass: 2,036,734 kg. Core Diameter: 9.9 m. Total Length: 102.0 m.